Is Samsung behind Wake Up stunts? Speculation is mounting over Sunday’s ‘Wake Up’ protest outside of Apple’s Sydney city store, as suspected perpetrator Samsung remains tight lipped on its involvement in the action. The stunt, conveniently recorded by video blogger Nate ‘Blunty’ Burr (see video below), saw a group of black-clad protesters jump off a black bus outside the George Street Apple store, before gathering around the store to chant ‘wake up’ and wave black and white signs emblazoned with the slogan. The words ‘wake up’ have also been displayed across billboards around the country and along the bottom of Bondi’s Icebergs swimming pool, representing a not insignificant media buy. 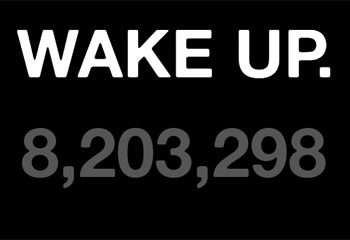 A website linked to the stunt, wake-up-australia.com.au, shows a countdown timer set to expire at 3pm on Sunday 6 May 2012. The website is registered to the ABN number of local ad agency Tongue, indicating that the site is likely part of a campaign. The stunt is today being reported around the web as being part of Samsung’s promotion of the Galaxy S III smartphone, but Samsung did not confirm or deny involvement when Marketing contacted its representatives, meaning the web is largely reporting on speculation (as are we, admittedly). The six days currently left on the wake-up-australia.com.au countdown will expire a few days after the Galaxy S III is due to be launched in London on 3 May. Whether Samsung is involved or not, the disruptive stunt is on message with Samsung’s advertising for products competing directly with Apple, including one that compared iPhone owners to sheep.